Love Is Where You Find It is a song from a Broadway show that ends with the words, "It's everywhere." Today the same goes for waterfowl; they're everywhere. Even our most urbanized areas now offer excellent wildfowling within a short drive; it's all in where you find it. Paul Cupka tosses an Avery floater. The snow began as a flake that in a flash became a near white out. Like the cavalry coming over the hill, we charged into the winter wheat field, put out a spread of full bodies and silhouettes, dropped into our layout blinds and were attacked by geese. It took less than an hour for the four of us, Paul Cupka, a father-son duo from Ontario John and Aaron Hitchins and me, to collect five hefty Canadas apiece. Twenty Canadas isn't shabby, especially when you consider we were hunting within 45 miles of our nation's capital; the place with the second worst traffic in the nation, a couple million people, urban sprawl, the Congress, politics, etc. Time was when waterfowl was hunted in specific areas; Chesapeake Bay and Maryland's Eastern Shore, the Illinois River, Arkansas, Louisiana, all largely rural states with hunting opportunities scattered far and wide. It still seems strange to me that my local waterfowl hunting has spread out into areas heretofore best known for white-tailed deer, quail and rabbits. However, with the proliferation of the Canada goose on office parks, golf courses and everywhere they can find food and water, opportunities abound. Our goose bonanza was discovered by Cupka, , who lives on the shores of Lake Anna, north and west of Richmond, Virginia. He owns a construction business that has him on the roads, and that combined with a network of scouts who watch remote areas for him, give him a good handle on the comings and going of ducks and geese throughout northern Virginia; from Richmond to the Potomac, Cupka has a good idea of where the birds are. Covered up and ready for the morning's flight. The snowy goose hunt took place on a farm he had never hunted. Once the geese were located, Cupka turned to his Fauquier County Plat Book, there learning the farmer's name, and called him to ask permission. We initially set up on a pond less than 200 yards from the ultimate showdown with the geese. Sharing the pasture were about 60 head of cattle and a young bull testing his initial testosterone rush. We moved him off several times, and every time we began calling, he began to bellow. As the predicted snow came close, we decided to move away from el torro to the pasture, and the rest is history. Although Virginia has a very rigid system of blind licensing on the Potomac River and its tributaries, it is possible to gain access to hunting the Potomac via the military reservations. Fort Belvoir is nestled into Fairfax County and both it and Marine Corps Base Quantico offer access to excellent river hunting. The morale support and hunting sections build and maintain the blinds, and all one has to do is to comply with the base hunting regulations and hunt. Military reservations require that all hunters attend an orientation session in the case of MCB Quantico they hold several briefing daily prior to the hunting season plus every morning throughout the season pay a nominal fee and receive your hunting privilege card. By lining up the evening before you want to hunt or arriving early in the morning, one can select from the open blinds, go out, set up and hunt. Nothing is supplied, so it is up to the hunter to have his own seaworthy boat, decoys, etc., but the opportunity is there just a few exits down I-95 from Washington, DC. Ducks close-to-home may call for off-beat tactics. If you want to hunt locally, you need a few tools. First, is time to scout. If you sit home wishing, nothing will happen. Riding the roads looking for geese can be productive. In addition, you need a good county map and a Plat Book that can be bought for a few dollars from the local Farm Bureau. The Plat Book shows the owners of every parcel of land, and that's the key to contacting the owner for permission. There are few states that do not require hunters to have permission to hunt. Often the owner does not farm the ground, but if he's amenable, he will refer you to the individual who actually farms the ground. You need his concurrence, as this prevents confusion and misunderstandings. Of course you need some idea where the birds might be to start your search. As much as golf-course superintendents would love to have their resident goose flocks removed, often there is just too much public pressure to allow hunting there. Interestingly, I hunted geese this winter on a private golf course less than 10 minutes from Pierre, South Dakota. Folks there have different ideas about hunting, although our fields of fire and pellet size were restricted by nearby housing developments, some of whose owners had protested earlier pellet drops. The blind of steel fence posts surrounded by chicken wire and appliance cartons camouflaged with discarded artificial Christmas trees, some with tinsel still hanging from their boughs was sunk into a drained water hazard with the decoys on a rise in front of a green. The blind was about as rudimentary as they get, but it worked because the birds were there. They came less than a quarter mile from the Missouri River, and although we never got a real in-your-face decoying shot, the pass shots were plenty close, especially because we were using high-performance ammunition, whose denser-than-lead pellets dropped the big Canadas with authority. As unique as this golf-course hunt was, if you can hunt near one, the prospects can be excellent. I have a shooting buddy who is in the construction business, and he has exclusive hunting rights to a field that has a golf course close to the north and east of the field is a large lake that supplies water and a roost for geese. Geese spend their nights on the water where they are protected from predators. So long as there is open water and food to be found, Canada geese stick around. The author and a "local" Canada. My buddy's field is ideally situated close to both of these necessities, and when the geese start using his field the shooting is fast and furious. Of course being close can often be too close. If roosting, resting and loafing geese hear repeated gunfire, they get wise to the location. So it is best if the roost area is more than just a hedgerow away. Looking at a map of any area can lead the eager hunter to potential hunting areas. Water and food; it's like a monk's mantra. Look for those combinations and you have a good chance of finding some good hunting. It won't last forever, but if you are careful get into the field, take your geese, quickly get out so they can continue to get into the field to feed and loaf you might be able to spin out several good hunts. Go back every day, and the fun will drop right off the table. Once you have geese located it is necessary to continue to check on them and watch them carefully until you get ready to hunt them. It is essential that you set up exactly where the geese have been in the field. Being off just a hundred yards or so can lead to a frustrating hunt with the geese landing too far to shoot, and sucking every goose into their location as they thumb their nose at your decoys. As I said, you need time to scout and watch the birds for successful hunting. Once you hunt a field, it might take a day or so for them to get back in, and then it takes more watching to again ensure their location before hunting again. Carefully done, a field can provide a number of quality hunts. In order to successfully hunt near home, you need some equipment. I keep a mixed duck rig and six dozen Real Geese decoys at the ready all season. The nearby Potomac River offers a smorgasbord of ducks from puddlers to divers. Recently, clouds of pintails were hanging around a couple of the tidal creeks that feed the Potomac, yet sharing the tributary was a long line of bluebills. I keep two bags of duck decoys that are a mix of life-sized mallards and bluebills, plus eight cork black ducks for tight places, three Canada floaters and three or four goose silhouettes to stick up on sand bars. All of this is subject to change depending on the species, but this mix is what I see hanging out on the river day in, day out. You will need to tailor your decoys to the species in your area, but these work in mine. In an area that is mainly frequented by mallards, I also see bluebills within a few yards of the greenheads. Even if bluebills weren't seen in that exact spot, I'd still use a few of them for their white sides that, like pintails, are an attractant to ducks in general. I'm not getting any younger, but this collection of decoys will easily fit in my 14-foot Gheenoe, and isn't so much that I can't hump it down a bank in a couple of trips, and it works just as well as a larger spread or one with magnum decoys. Add to this a layout blind, perhaps the most versatile item in our arsenal that is easily concealed in fields, on the shores of ponds, streams and about everywhere, and I'm ready. So much of waterfowling depends on the weather. It is largely thought that as soon as the temperature drops, geese and ducks have to get out and feed. Maryland outfitter Tom Dodd, who lives on his family's farm surrounded by as many as 10,000 Canadas each season says, "Geese can sit for three or four days, even in the coldest whether, until they have to go out and feed." Certainly, blustery changing weather will make waterfowl move and feed. Our sudden snow storm certainly made some of the geese move, but not all. Combining decoys to simulate a living flock. On my way home on a recent cold and windy day on the Eastern Shore, I saw every goose crowded against the lee shore, sitting out the low-teen wind chill. Weather is important, but it isn't always the ticket. With that in mind, scout not only the feeding places but the resting areas. Often farm ponds hold ducks and geese, and they can provide a fun shoot, provided you can get permission. Many are eager to have geese moved along do to the polluting of ponds from their droppings; others like to see them. The final day of this year's early season, I had a great goose hunt on a farm pond near Frederick, Maryland, far from the Eastern Shore. Be sure if you hunt a pond that you have a reliable retriever or boat to pick up the kill. Often the wind will move dead birds to the windward side, but we can't always count on that. When asking permission to hunt, it's a good idea to invite the farmer to join you. Farming is a tough business, and often farmers have plenty of game, but often don't have the time to hunt it, and in the case of waterfowl hunting, the equipment to successfully hunt. Ask them along, and let them have the first shot at the birds, and you'll probably cultivate a long-term relationship that may include him calling you when the birds are right. The more scouting eyes, the better the chances of finding huntable birds. One ironclad rule is making every attempt to leave the field or pond just as you found it. Pick up the fired hulls, pick up the wads, they will tend to be all in one or two places, and anything else that doesn't grow there. Stay on the roads and lanes. It's easier to drive through a field, and when the ground is hard it may not hurt, but farmers are sensitive to the compacting of their soil, so if at all possible stay on the lanes. If it's necessary to drive to the hunting location, take only one vehicle. Pile your guns and gear into one vehicle and walk out. Respect for the land pays big dividends, and leaving it as it was gains respect for you from the farmer. Freelancing an urban area may take some equipment, but don't be eager to run out and buy a bunch of stuff until you see what you opportunities are, and what you really need, then buy good decoys, layout blinds and other equipment that will last. Keep in mind that ease of transportation is important, and because you may have to carry it a ways, bags with carrying straps are worth their weight in gold. Hunting close to home is actually a return to hunting as it was a century ago: Finding birds, then figuring out how to hunt them. 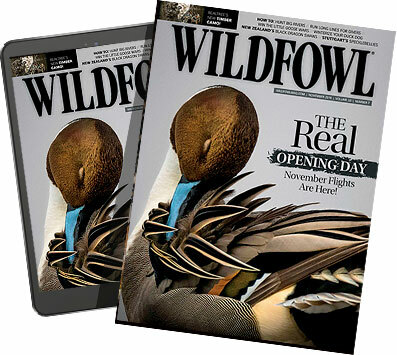 We have the best equipment, ammunition and guns wildfowlers have ever owned, and hunting close to home puts it all to work with the ultimate reward of harvesting ducks and geese where they really ought not be.